Công An Nhân Dân v Nam Định isn’t a fixture too many fans in Hanoi would care about, let alone attend. Quarter to five on Saturday afternoon, I’ve paid a fella to look after my bicycle, strolled along the side of the main stand and towards the unmanned entrance. I smiled at two guys wearing Nam Định shirts; visiting fans from 85km south of Hanoi (or more likely, students in Hanoi from Nam Dinh). I heard the sound of a drum. Not many people attend V League 2 matches in Hanoi, especially when it features the cities ‘third’ team; cong An Nhan Dan, the Police team. I chose a seat in the upper tier, for what I like to refer to as a tacticians seat, able to see the movement and formations of the teams, but further from the action. I smiled at the few people seated near me, their shoes/sandals off, feet on the chairs in front. “Hey, Bill!”, startled, I saw Thao, one of the T&T Contras, “You really love football! She said. It was then I noticed, I too had slipped my shoes off and my feet were perched up like everyone else, without even realizing. CAND v Nam Dinh was to me my 84th match in Vietnam since starting this blog. Officially there were 500 people in attendance. Realistically I’d put that figure at 150. minus off the WAG’s, extending family and players friends, the actual number would be near 80-100. I had reached new levels of football geekdom. Which like a true football nomadic geek I found rather pleasing. The match itself was quite good. I wasn’t expecting much; the V League 2 isn’t exactly filled with goals, both teams had mustered just 11 between them after seven games this season. 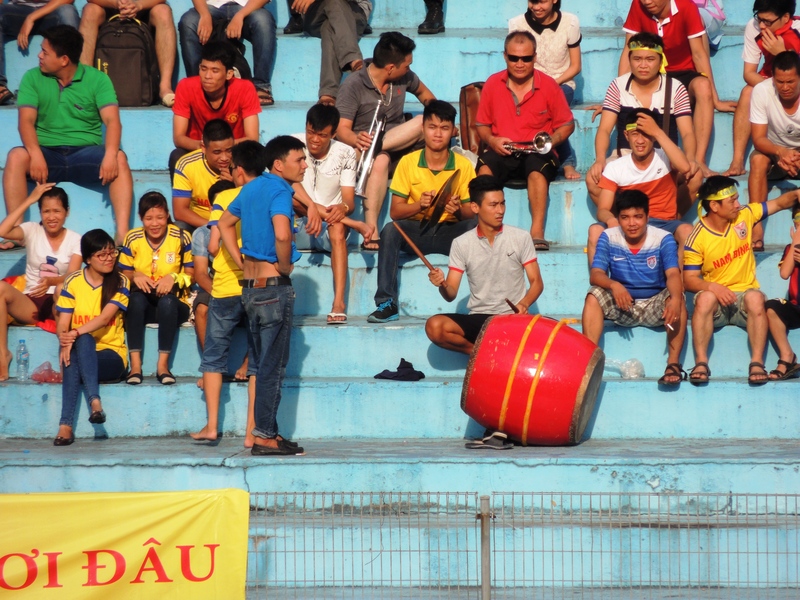 The visiting support, led by a great drummer (who looked remarkably like the drummer for HaNoi FC!) were in fantastic form. However, the CAND players had different ideas. Their high tempo tactics, which were especially impressive given the heat and humidity in the Hang day stadium, paid dividends early on as Nguyễn Hữu Sơn broke the deadlock. The travelling fans were silenced. By half-time it was 3-0 to CAND, who were belittling their league position of second bottom with some fine attacking football. Sơn grabbed his second of the match, after Nguyễn Như Tuấn had put the home side two up. With the game effectively over, the second half dropped off in pace and quality. The travelling fans were silent until their drummer and trumpeter played what can only be described as music suitable for a defeated battalion; the injured few making their way back home. Then suddenly out of nowhere the drummer raised the roof with a splendid fast paced solo to give Nam Định a final boost at the end of a difficult afternoon. And it paid off! Their final attack of the game led a to a penalty, which Nguyễn Đức Anh Quốc converted with the last kick of the game. 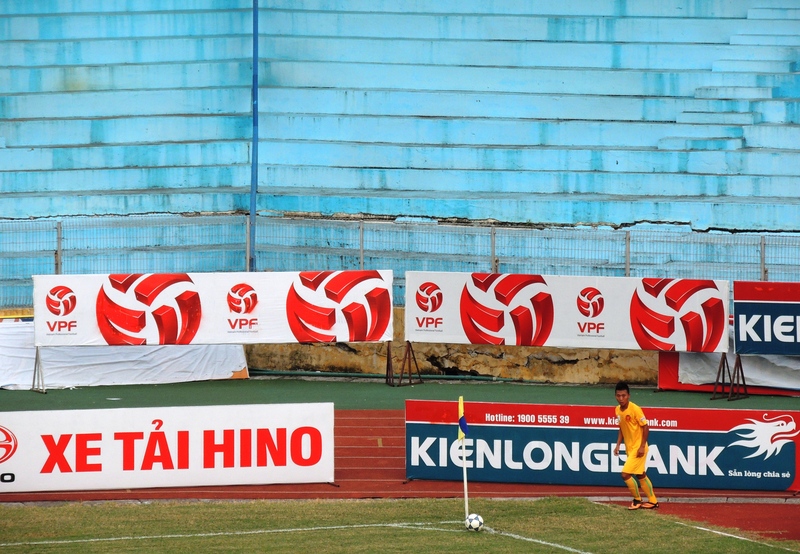 Elsewhere in the V League 2, Hà Nội FC moved to the top of the table as promotion rivals Hue lost at Ho Chi Minh City. Hà Nội FC sealed three points with a 3-2 over Đăk Lăk, in the coffee highland region of Vietnam, with a brace from Nguyễn Quang H ả and one from Nguyễn Xuân Dương. Gripped by the promotion chased to join Vietnam’s elite next season and I’ve already purchased train tickets to travel to Hue to see HaNoi FC’s visit in two weeks time. A cheeky trip to Nam Dinh should probably happen due to it proximity to HaNoi too……..